Can be used to grind glaze drips or kiln wash off of rough bottoms of pots after firing. 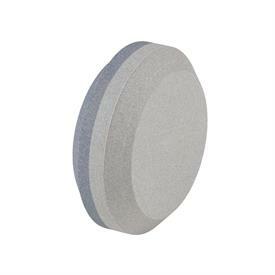 Can also be used to grind off a kiln shelf, or sharpen a trim tool! It's dual grit surfaces has a rougher grinding side and a smoother grinding side. Perfect for cleaning up the bottoms of soda or wood fired pottery. Fits right in your hand and lasts a lifetime. Take the sharp edge off a glazed corner, remove stuck kiln wash off a project. this tool is incredibly handy to have around!